Программа обучения Кодокан Дзюдо институт Дзюдо Для тех, кто хочет овладеть Дзюдо, Кодокан предлагает классы. Программа уполномочена как не обычную школу по Токио правительство. Курсы включают в..
1 Month Judo Martial Arts Training in Tokyo, Japan..
now practiced worldwide. A highly evolved grappling art, it focuses on jujutsu-derived techniques chosen for their efficiency and safety in sporting competition. Judo athletic competitions reward effective throws and groundwork that result in control of the opponent through a hold-down, a sport-legal joint lock, or a choking technique that results in either submission or unconsciousness. An Olympic sport since 1964, judo is a modern derivation of jujutsu as interpreted by founder Dr. Kano Jigoro (1860-1938). Kano, one of the most remarkable figures in the modern history of the martial arts, chose the term judo (sometimes rendered find о in his time) quite deliberately. “Jujutsu” he interpreted as “an art or practice (jutsu) of first giving way (ju) in order to attain final victory” (Kano 1989, 200); he intended his judo to be not a contrast, but an expansion of this stratagem. “Judo means the way or principle (do) of the same,” he wrote (Kano 1989, 200). He further explained that jujutsu, as he experienced it prior to the founding of his school, was the specific application to personal combat of the “all-pervading” judo principle (Kano 1989, 200). Judo, then, as Kano envisioned it, included the wide application of martial virtues outside a strictly combative context. Kano, an educator, favored the preservation of traditional jujutsu partially through its development into a modern sport compatible with post-feudal Japanese society. Thus athletic competition in the Western sporting sense has been a distinguishing feature of judo since its inception, although the techniques that are legal and effective in judo matches actually comprise only part of the art’s syllabus of instruction. Because of judo’s comparatively recent development and the academic orientation of its founder, the art’s history is very well documented. The roots of judo are in the traditional jujutsu ryuha (styles) of the late nineteenth century, particularly the Tenjin Shinyo-ryu and the Kito-гуй, which Kano studied extensively, and in Yoshin-ryu, from which some of his senior students, including Yoshiaka Yamashita, were drawn. These schools of unarmed combat, while all referred to as jujutsu, were distinct entities with separate courses of instruction on the feudal pattern. Tenjin Shinyo was particularly noted for its atemi (striking) techniques and its immobilizations and chokes; Kito-ryu, for projective throws, spiritual ideals, and strategy. Yoshin-ryu, attributed to an ancient doctor’s application of resuscitation methods for combative purposes, took its name from the flexible (and thus enduring) willow tree, a manifestation of ju. The idea of selective yielding for tactical advantage was common to these schools of jujutsu, though it varied in development and expression. Kano had acquired both a classical Japanese education and thorough instruction in the English language in his youth, but apparently his father (a Meiji reformer) did not encourage an early interest in the martial arts. Jigoro was 17 years old when he began his study of Tenjin Shinyo-ryu, but he threw himself relentlessly into his training and showed a remarkable facility for deriving and applying the essential principles behind techniques. He took every opportunity to expand his knowledge and prowess. In fact, he researched even Western wrestling at the Tokyo library, drawing from it an effective throwing technique later included in the judo syllabus as kata gumma (the shoulder wheel). By 1882, it was clear that Kano was a martial prodigy, and he had determined that his life’s work lay in the martial arts. He founded his Kodokan (Institute for the Study of the Way) in that year and set about the imposing twofold task of preserving jujutsu while adapting it to the changing times. The new school soon attracted attention, both from students enthusiastic for the training and from skeptics wary of Kano’s new approaches to training. Perhaps the best of the former was Yoshiaka Yamashita, who came from Yoshin-ryu and became Kano’s right-hand assistant. Certainly the most dramatic instance of the latter came with the “great tournament” of 1886, a jujutsu competition in which Kano's school (represented by Ya-mashita and some other highly skilled students) scored decisive victories over prominent and long-established jujutsu styles. After this tournament, Kodokan Judo enjoyed increasing levels of governmental support, and was eventually (in 1908) even made a required subject in Japanese schools. This was especially gratifying to Kano, whose intended focus was on character development for the succeeding generations rather than simple martial prowess for a selected elite. Even before the turn of the century, judo had also attracted attention overseas. Stories of the prowess of jujutsu practitioners had circulated in the West since the opening of Japan in the mid-nineteenth century. Now a new form of this art had arisen, and it was not only shorn of the feudal secrecy that tended to shield jujutsu from Western eyes, but was being developed and promoted by a fluent English speaker well versed in Western educational thought. Thus, judo was the first Oriental martial art to be truly accessible to the West, and it caused an immediate sensation upon reaching foreign shores. Naturally, it was immediately compared and contrasted with the unarmed combative sports most common in the West, boxing and wrestling, and early judo manuals in English devote much space to instructions on countering these methods. “Challenge matches” were not uncommon in the early days of Western judo, and since these matches were not overwhelmingly decided for or against any of the sports, speculation (informed or otherwise) on the relative merits of the methods was even more common. Matters were complicated further by a certain confusion about the distinction between judo and jujutsu, with practitioners of either using both terms freely. Yoshiaka Yamashita, still Kano’s senior student at the turn of the century, was one of judo’s pioneers in the West. No less a personage than the American president Theodore Roosevelt (a lifelong enthusiast of combative sports) requested a judo instructor in 1904, and this prestigious duty fell to Yamashita, who was already touring the United States. Roosevelt was a good student and an influential voice in support of the new sport, and his studies (coinciding with much American and British sympathy for Japan in the Russo-Japanese War) helped ignite the first Oriental martial arts boom in the English-speaking world. For many years judo remained the dominant Oriental martial art outside the East and was in fact often incorrectly used as a catchall term for unfamiliar forms of Asian fighting. Judo was uniquely suited to dissemination across cultures, and in Japan Kano was pioneering the dissemination of judo in another direction as well. Joshi judo (women’s judo) began with his acceptance of his first female student in 1883. Over the following years, a Women’s Section of the Kodokan, with its own separate syllabus and eventually with women’s sport competitions, developed. Kano is said to have commented that the Women’s Section preserved more of his intentions for judo, with its lesser emphasis on competition. The growing emphasis on sport judo probably occasioned this comment. The evolution of mainstream judo has progressed steadily in the direction of competitive sport in the manner of Western wrestling, much to the chagrin of many instructors. An Olympic event since 1964, judo is often coached today simply as an athletic activity, without regard to Kano’s principles of strategy or character development or to martial arts applications outside the set of techniques useful in competition. 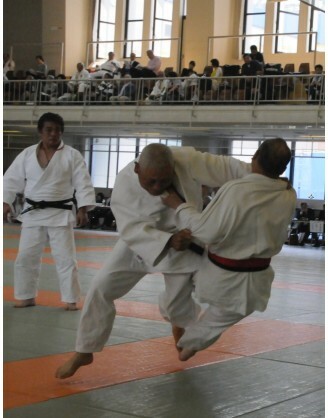 However, Kodokan Judo retains its traditional elements, including all seven divisions of technique. These include, of course, the throws, immobilizations, and chokes (nage-waza, osae-waza, and shime-waza), but also dislocations and strikes (kansetsu-waza and ate-waza), formal exercises (kata), and resuscitation methods (kappo). Judo ranking (indicated by the color of belt worn with the traditional dogi [training uniform]) is dependent on demonstrated proficiency in these areas as well as points scored in competition. The belt color ranking system, which originated with judo, has been adopted by a great many martial systems and has occasioned much debate. The dan/kyu system, in which the more advanced or dan ranks are usually designated by a black belt and the lesser kyu grades by a variety of colors, is one of the most widely recognized features of Japanese and some other Asian martial arts, and it is often assumed to be of great antiquity. In reality, it represented another facet of Kano’s innovation and modernization, since it presented a format for standardizing the development of the judoka. Older systems more commonly awarded diplomas or certificates, and historically seldom established any formal hierarchies among students prior to graduation from training. Recognition of various intermediate ranks among students became more common during Japan’s peaceful Tokugawa era, but retained a feudal flavor of esoteric initiation. Rank among students was not signified in any uniform, visible manner. The emphasis instead was on access to, and eventual mastery of, a school’s “inner” or “secret” teachings (okuden). The highest award in this methodology was the menkyo kaiden, which certified that the bearer had attained mastery of the system. By contrast, the “black belt” of the dan/kyu system is usually taken to indicate a “serious student” or “beginning teacher” of a style; the lack of secrecy in the judo tradition, and in most modern derivations of martial arts, changes the meaning of initiation. Progress in the pursuit of judo can include rites of passage and formal recognition of proficiency, but tends to reflect the Meiji values of Kano rather than the feudal orientation of its root arts. As the American judoka Bruce Tegner wrote in response to assorted Western folklore about the black belt, “The earliest black belt holders were not deadly killers; they were skilled sportsmen” (1973). Indeed, belt rank and sport competition were both highly controversial Kano innovations that continue to lend themselves to a wide range of interpretations, criticisms, and uses and abuses to this day. The freestyle practice of judo techniques takes two forms, shiai (contest) and randori, which is an unchoreographed but not formally competitive exchange of throws and counters. Kuzusbi, or unbalancing, is fundamental to both practice forms, and is carried out in accord with the judo proverb “When pulled, push; when pushed, pull!” It is also a judo cliche, first widely noted in the early years of Western judo, that size and strength are relatively unimportant in the employment of the art; this probably derived largely from the success of relatively diminutive Japanese experts against larger but unschooled antagonists. Unfortunately, this proved illusory in the case of judo players of comparable skill who were greatly mismatched in size, and designated weight classes are thus a feature of modern sport judo. Today, the International Judo Federation is the governing body of Olympic judo, while the Kodokan in Japan remains the world headquarters. A variety of national and international federations for judo study and practice exist worldwide, and instruction is relatively easy to come by. Judo players have also ventured into interstyle grappling events, and judo remains a strong influence on grapplers of other styles (especially those, such as the Russian sambo, that include the wear and use of a jacket). As the first Asian martial art to gain a worldwide following, judo had important formative influences on many other styles. In particular, those styles (such as the Israeli krav maga) that descend in part from military commando training, and sport grappling or “submission” styles, including Brazil’s Gracie Jiu-jitsu, owe a considerable debt to judo. Worldwide, military and police trainers have seen the advantages of judo for unarmed hand-to-hand combat and have integrated it into their programs of instruction almost from the beginning of the twentieth century. Judo movements are not as inhibited by typical battle dress as are the techniques of many other martial arts, while the presentation of the art in a physical-education format has made it easier for military instructors to adopt (and adapt to their own ends) than the more esoteric curricula of other styles might have been. Wrestling or submission styles, meanwhile, profited both from direct instruction by judoka and by interaction with the new judo techniques and strategies they encountered. Kano student Mitsuyo Maeda, one of the judoka assigned to bring the new art to the West in the first decade of the twentieth century, accepted both judo challenges and matches as a professional wrestler, and was the original instructor of the formidable Gracie family of Brazil (where Maeda was known as Conte Comte [also Conde Koma], the “Count of Combat”). Renowned wrestler George Hack-enschmidt, meanwhile, declined to accept challenges from judoka (probably because, as world heavyweight champion, he had nothing to win and everything to lose in a bout with the much smaller Japanese who challenged him) but recommended training in judo, as well as Greco-Roman and freestyle wrestling, for any serious grappler. He saw the development of excellent balance, as well as the unique “idea” of the style (by which he probably meant the ju principle), as invaluable benefits of training. Judo advocates commonly add that judo includes the benefits of most traditional Asian martial arts and adds to them those of a modern, competitive, full-contact (but safe) sport. Dr. Kano’s judo continues to enjoy a prominent place among the world’s martial arts, and while it may not always manifest his original ideals in practice, it remains the most successful fusion to date of Oriental martial art with Western principles of physical education. If you want to book and train any kind of Martial Arts around the world, please, choose only reliable and tested GYM's and camps, such as those listed at category Judo. We collect and publish reviews about all camps and school around the world, if you want to write review about Judo, please use tab Review in camp description block above.